WASHINGTON, D.C. -- Americans' belief that the U.S. energy situation is very serious has dropped to within one point of its all-time low. Currently, 23% say the nation's energy situation is "very serious," down from 28% last year. With the exception of one 22% reading in 2002, this is the lowest percentage since Gallup began asking the question in 1977. The latest update of Americans' perceptions of the energy situation is part of Gallup's annual Environment survey, this year conducted March 1-5, as the Trump administration has begun rolling back Obama-era regulations on the energy sector and reviving the construction of disputed oil and gas pipelines in the Midwest. 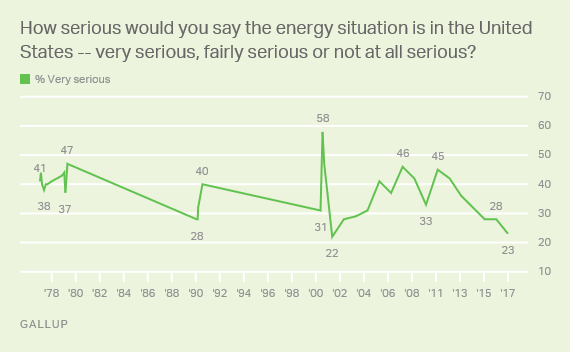 Gallup first asked Americans to rate the nation's energy situation in the late 1970s, then again in the early 1990s and on a yearly basis since 2001. The question has been asked 34 times in all, with an average 37% rating the energy situation in the U.S. as very serious over that period. In this year's survey, 23% say the energy situation is "very serious," 51% say "fairly serious" and 23% "not at all serious." 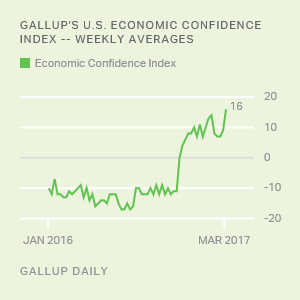 The combined 74% who rate the situation as very or fairly serious is one percentage point shy of the lowest Gallup has measured. Americans' "very serious" ratings have ranged from 22% to 47% over the years, with the exception of a 58% reading in May 2001, recorded just after electricity shortages in California caused that state to enact "rolling blackouts." The record-low 22% reading in March 2002 reflected a diminished concern about problems other than terrorism after 9/11. The public's current low level of concern about energy most likely reflects the low price of gas, which has averaged below $3 per gallon in the U.S. since November 2014. It may also reflect public awareness of the United States' increasing ability to produce its own energy supplies -- including the extraction of oil and gas from domestic shale and the use of alternative sources such as wind and solar. Additionally, Americans may be aware that per capita use of energy has been declining in recent years, and that automobiles, homes and appliances are becoming more energy efficient. A separate question included each year in the March Environment survey asks Americans how much they personally worry about a series of problems, including "the availability and affordability of energy." This year, 27% of Americans say they worry about energy "a great deal," tied with the readings last year and in 2003 as the lowest in this trend question's 17-year history. Americans were most worried about energy in 2012 and 2006, both years in which 48% said they worried a great deal. Worry about the availability and affordability of energy is the lowest on the list of 13 problems tested in the March survey. 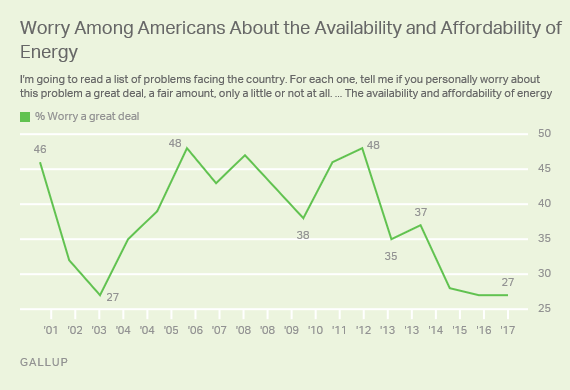 By way of contrast, 57% of Americans in the survey say they worry a great deal about the availability and affordability of healthcare. I'm going to read a list of problems facing the country. For each one, please tell me if you personally worry about this problem a great deal, a fair amount, only a little or not at all? First, how much do you personally worry about -- [RANDOM ORDER]? Sorted by "A great deal"
This year, in addition to the 27% of Americans who worry a great deal about energy, another 32% say they worry a fair amount, 30% only a little and 11% not at all. The combined 41% in the "only a little" and "not at all" categories is the highest in the history of the trend. Americans clearly have things on their minds other than the supply and cost of energy. Worry about energy is at a record low, with ratings of the seriousness of the energy situation within one point of a record low. 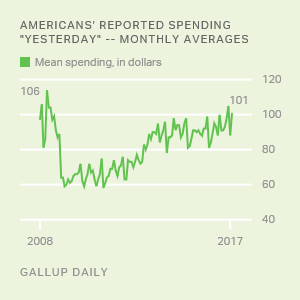 Additionally, almost no one mentions energy or gas prices in Gallup's ongoing monthly update of views of the most important problem facing the nation. The general lack of worry about energy suggests a low level of public pressure on government officials to adopt new energy policies. However, this could change in the event of a sudden jump in oil prices or another situation disrupting the flow of oil and other sources of energy -- and the low energy prices -- Americans are enjoying today.